ARLINGTON, VA – The U.S. Environmental Protection Agency (EPA) today issued a final exemption clarifying that dairy farms don’t have to treat milk the same as petroleum products under the Spill, Prevention, Control, and Countermeasure (SPCC) regulation. NMPF has been working with Congress and the EPA for two years to win the exemption for dairy farmers, so that their bulk milk storage equipment doesn’t get regulated under the SPCC rules, since milk storage is already regulated as part of the current Grade A Pasteurized Milk Ordinance (PMO). The goal of the SPCC program is to prevent oil spills into waters of the United States and adjoining shorelines. A key element of the program calls for farmers and other facilities to have an oil spill prevention plan, called an SPCC plan. NMPF expressed concern to federal authorities that the EPA was unnecessarily grouping together fuel oil and milk, and asked the EPA to exempt milk. In June 2010, the EPA committed to finalizing the SPCC exemption for bulk milk storage “as expeditiously as possible…to have that process completed by early 2011.” Today’s announcement is the culmination of that effort. Even with today’s exemption of milk handling equipment, many farmers still need to have an SPCC plan. Such plans are required for farms which have an aggregate storage capacity of oil products of 1320 gallons, or more, for every storage container larger than 55 gallons. A farm with less than 10,000 gallons of total storage capacity and no single storage greater than 5,000 gallons can self-certify their SPCC plan. Farms that do not meet this exemption must have a plan certified by a professional engineer. NMPF has completed the development of a self-certification template tool to assist dairy producers in developing their SPCC plans that covers all fuel and oil storage on the farm. The template, developed with assistance from the U.S. Department of Agriculture’s Natural Resources Conservation Service (NRCS), is available on the NMPF website. 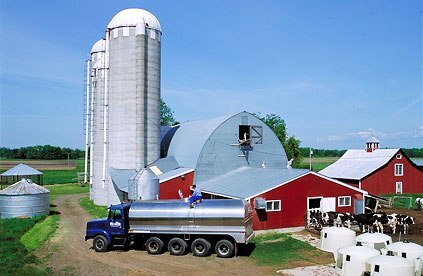 The National Milk Producers Federation, based in Arlington, VA, develops and carries out policies that advance the well being of dairy producers and the cooperatives they own. The members of NMPF’s 31 cooperatives produce the majority of the U.S. milk supply, making NMPF the voice of more than 40,000 dairy producers on Capitol Hill and with government agencies.